You shoulder the burdens of your reality bravely and quietly. You bear the trials that most can’t see or understand. You courageously arise each day with the hope that today – *this* day – will be better. You silently persevere despite obstacles from which most would shrink. Your well of strength bubbles to the surface, a rich aquifer from above, linking your reality to hope, courage and faith. Strife volleys for your attention, but you fight back. And although you are strong beyond measure, your burdens are heavy, even unbearable at times. Today, consciously choose to lighten your load. Set down your cares, worries and troubles. Bravely unshackle yourself from the pain and discard the uncertainty of tomorrow. Free yourself from the struggles of the past. Make the choice to live powerfully present in this moment and embrace the beauty that is in the palm of your hand right now. Allow gratitude to fill your soul and clasp it tightly, feeling the uncommon grace it brings. 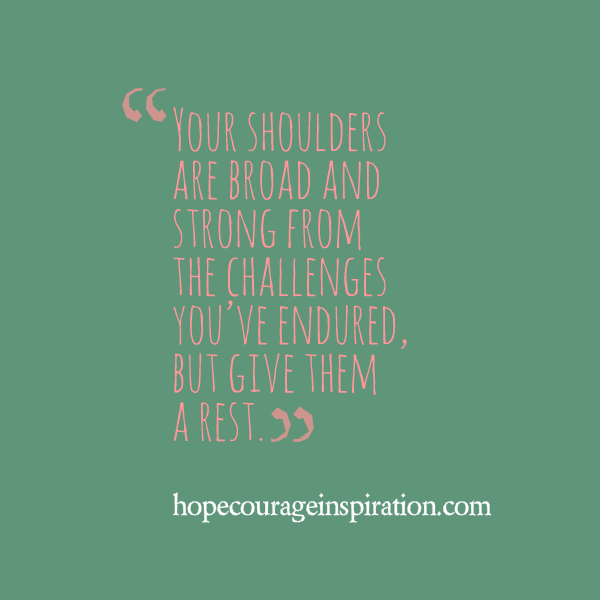 Your shoulders are broad and strong from the challenges you’ve endured, but give them a rest. Relish today and the positive opportunities it brings. Seize the unique blessings of the current moment and allow your troubles to melt away.